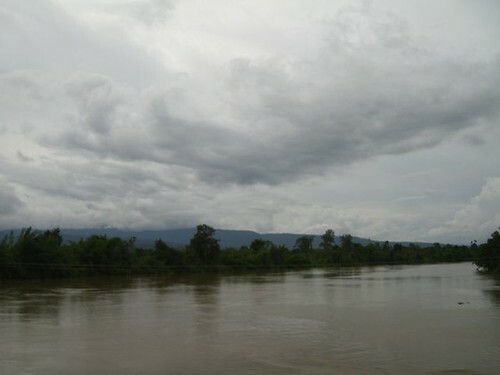 There's been flooding along the Mekong in Laos. 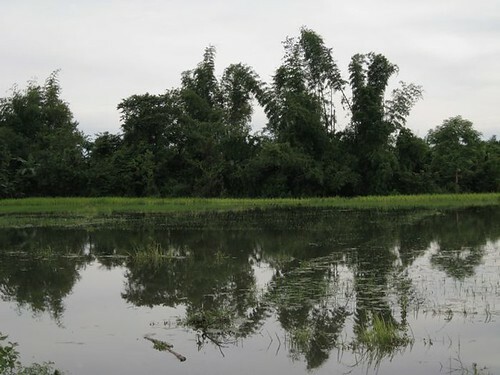 It has been raining heavily since the beginning of August, and there have been flash floods in the north, wiping out rice fields and corn fields along the rivers. Along Route 13 north, a couple of sandy slopes flopped onto the road; even when cleared out, they cover the road again. In spite of the difficulties, it's actually a lot better than in previous years - the highways dept. has shored up a lot of the unstable grades in Xieng Khouang and Huaphan and there haven't been as many landslides as before. Along the southern parts of the river, the river rose up and over the Route 13. Many of these villages get flooded every year - people are accustomed to the bottom floors of their houses getting flood and most people build houses on stilts. 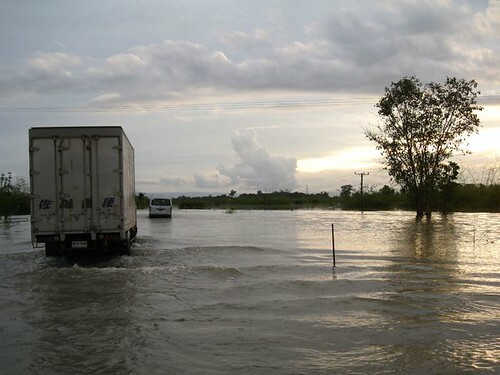 However, this year, the waters rose up over the road and wiped out large areas of rice fields. This is the main rice growing areas of the country so the impact on many people's lives will be great. One indicator of poverty is how long people can survive on the rice they farm - the most poor don't have the land to grow enough to last them through the year, and many people sell rice if they have a problem with health or other immediate money need. 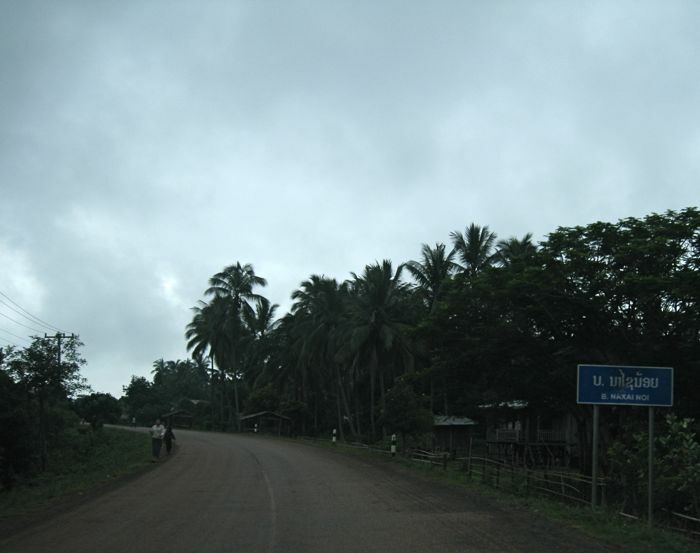 People can make up the short fall by going to Thailand and working as unskilled and exploited labor, or migrate within Laos for other forms of work. We started off early in the morning, under gray and threatening skies. By the way, this village has the best coconut trees in the district. People sell coconuts by the road and you can sit in a bamboo hut and drink fresh coconut juice while taking a break. We had to pass on this trip. View along the road (above). 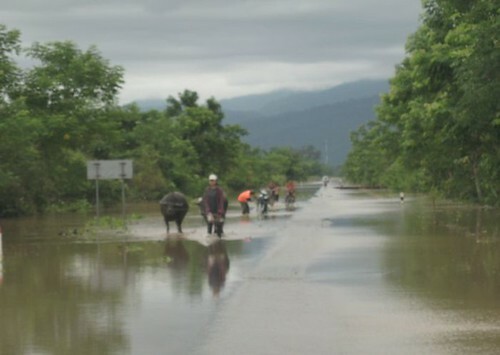 We decided to try to get to Vientiane on Sunday because we heard there would be more rain, and we worried about more flooding. The skies stayed like this for some time. Around Tha Khaek, the sun came out. The waters on either side of the road lapped gently at the edges. A lot of people from the city had gone to the road for picnicking and fishing. One of the basic principles in Lao life - if you can't do something immediate about the situation, at least have fun. Once things were either cleared from the houses or left as lost, just get on with life! But the floods still were not good. When we drove along this section of the road, just the week before, these rice fields were healthy. If the head of the rice plant is underwater for more than 48 hours, it's dead. 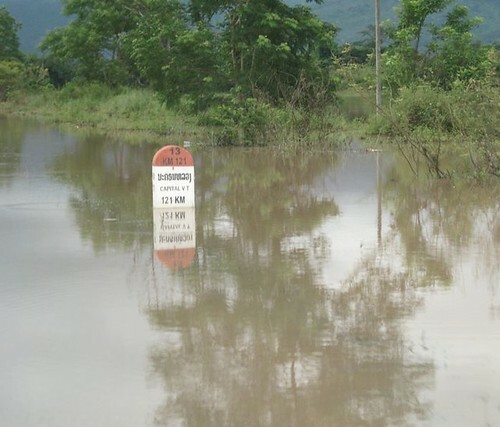 This was the worst stretch of the road - the depth of the water was about 2.5 feet and the width was 4 kms. We still had 121 kms. to go. 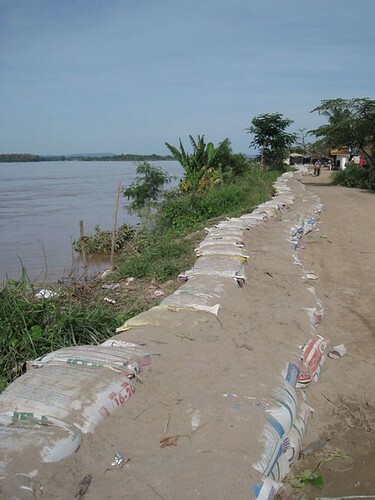 Meanwhile, back in Vientiane, people had been sandbagging the length of the levee from west to east Vientiane. Hatxaifong District, the agricultural area of the capital, was entirely underwater and I'm sure most of the crops from there will be lost. This is the area at Wat Sribounheuang, about 2 km from my house. 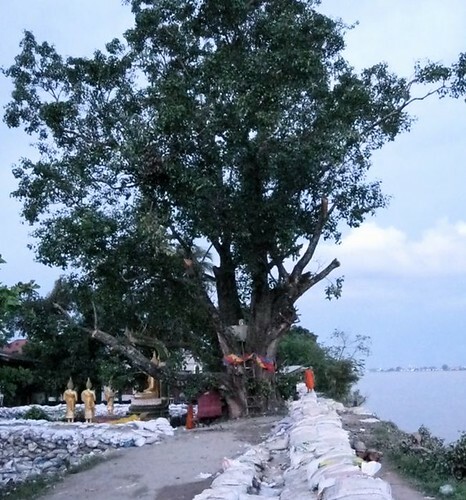 They sandbagged both the levee and the area around the Buddha images. I don't know why they did it, but this beautiful Bodhi tree got trimmed. The branches on the river side extended far over the bank. I have some links to the views of the tree in better days here. Anyway, this long winded entry is my contribution to Skywatch Friday. It's been getting bigger and better every week - this week, my number is 375. That means that there are 374 entries before mine. Impressive! 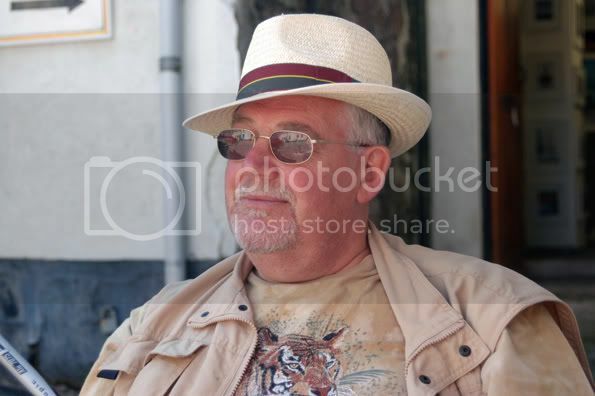 I just bookmarked your blog...I want to come back and explore more. If not for knowing what the skies have meant for where you are, they would sure be pretty. It can be very dramatic when it's raining so much, but it sure gets good photos! Dramatic, but I think they are used to floods in these parts. Thank you for this serie of photos wich gives us a good view what happened there. Great SWF contribution. That's some preparation going on! I hope the bodhi tree was trimmed for its own good with a storm pending. Photos like this remind us of the diverse world and conditions we all see, and are all united under the sams sky. A sky which brings birth and regeneration and also devestation. Chan: Thank you for sharing the views of the flooding in Laos. The photo of the greenery reflecting was very beautiful while the reat are very sad. It's a shame to see the people trying to walk through the water. I do hope you dry out. Your photos are wonderful, they show the sadness and trouble these folk suffer. I hope by now the floods are history. Sometimes Nature become hard. Thanks for your report. Great blog. So sorry about the floods. You have captured some amazing images of what has transpired. Thanks for coming and seeing my Sky Watch. I am glad I am here visiting your blog again! 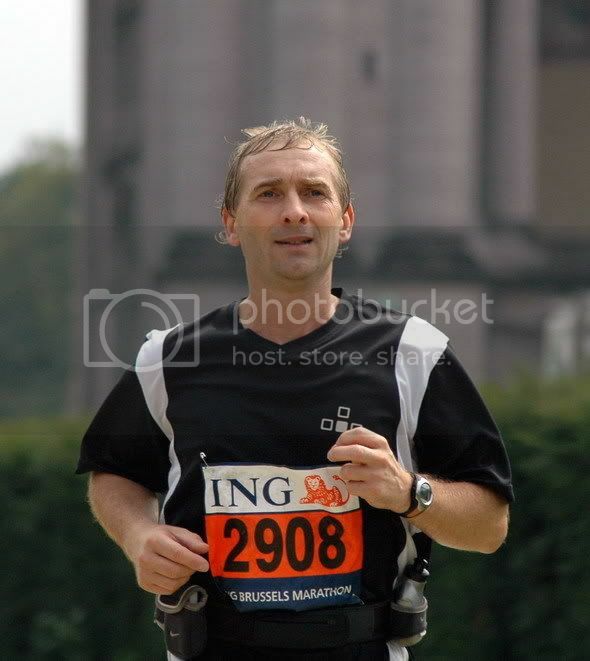 Great photos and very good reportage! My goodness! This is aweful! I hope you are safe and that by now things have drained some and beginning to dry up some. Thanks for showing us what is going on over there and sharing the experiences all are suffering through. I feel ashamed at moaning about our 'wet weather' and small flash floods.... this as been a great if not sad post to readbut you made a great Sky Watchpost out of it... many Sky watchers will be moved by this. wow what a rain. you captures great. Oh that's really sad. While we had severe flooding here in Florida - it's nothing compared to what people endure in the Mekong Delta.